I'm beyond thrilled to partner with Shops Around Lenox for the annual Jingle Bell Frock showcasing holiday party wear from fab'rik. I mixed my stylish new pieces with a touch of vintage. 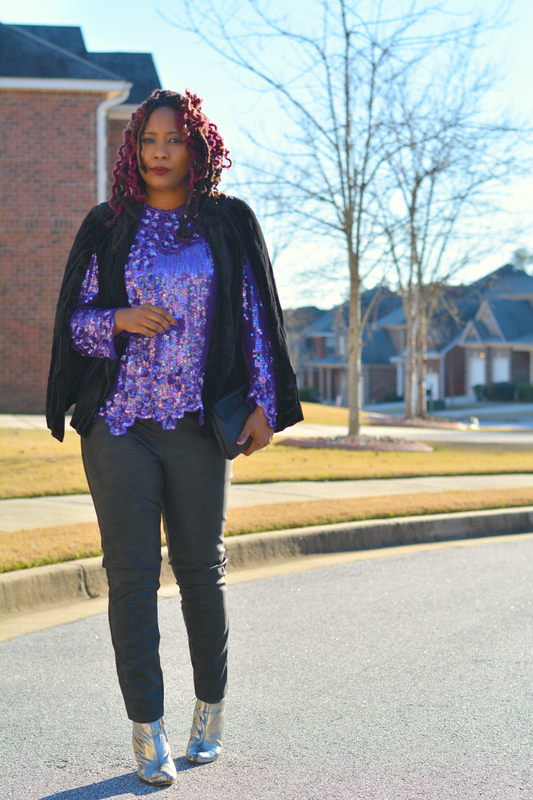 I love to put together fancy casual looks that are glam yet comfortable. fab'rik had just what I needed for a Christmas party I attended over the weekend. The boutique like store has become one of my favorites since moving to the south. They have unique clothes that are sold in limited quantity. Very much like a thrift store in that respect. That's how I fell in love with this fashion forward and always on trend brand. 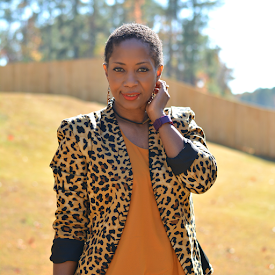 fab'rik offers "high style without attitude or sticker shock". I squealed when my eyes locked on the capelet. I love capes and this one stood out because of the blazer cape hybrid. It's trendy but the classic black and velvet will give it lasting power for many years to come. 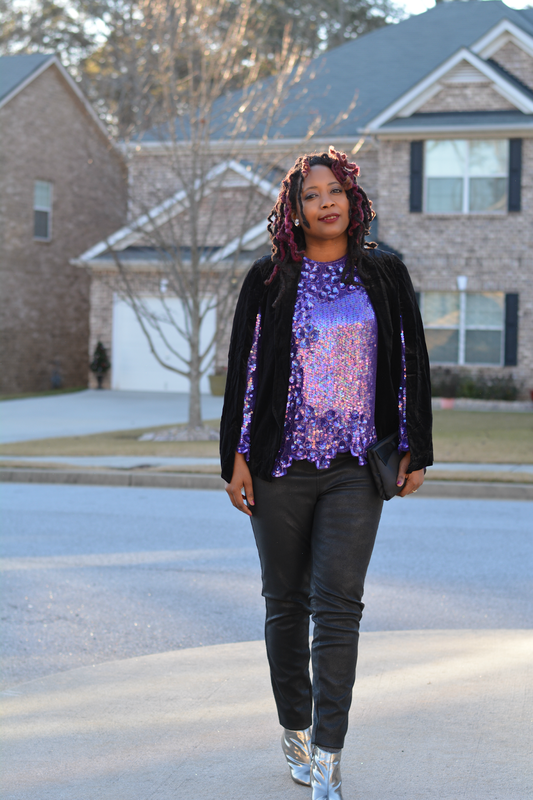 It works very well with my vintage sequin top. I found it an estate sale. It was the only garment hanging in a bedroom closet. It was just waiting for me to show up. 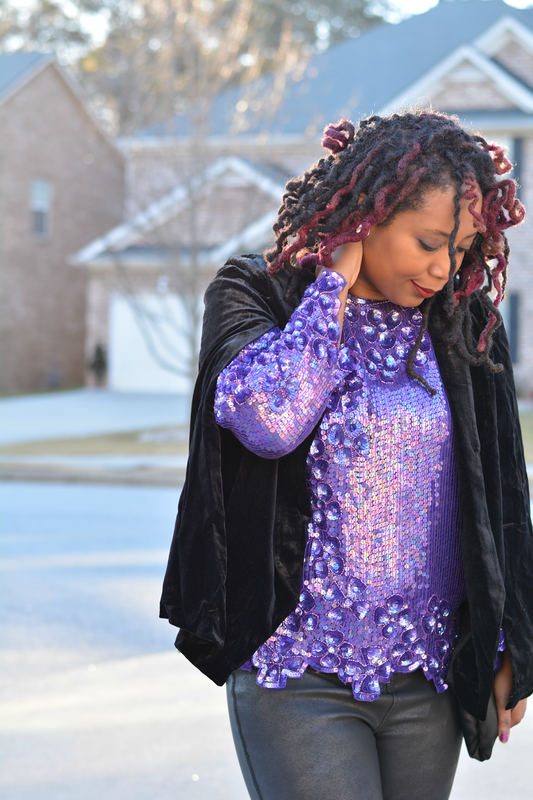 The purple sequins look great peeking out from under the cape. 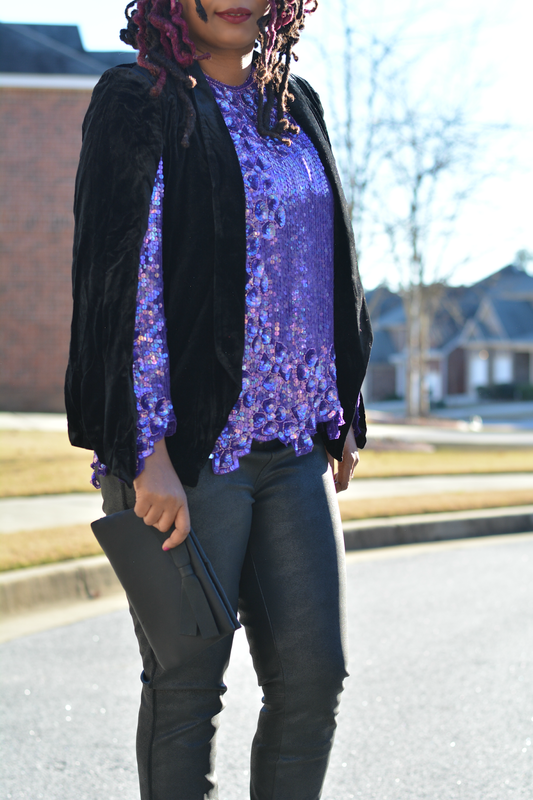 There's something really special about velvet and sequins. It's so holiday glam. My other vintage pieces include ultra big and brilliant rhinestone earrings found at an estate sale and a dainty vintage satin clutch from a thrift store. 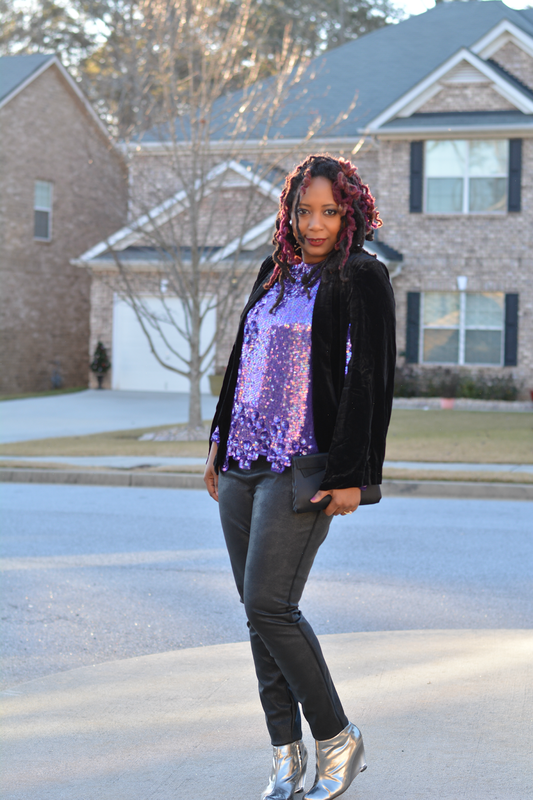 I added a casual edge with my other fab'rik purchase -- faux leather leggings. The pull on pants are sleek with great texture and the perfect amount of skinny. I'll be able to get lots of wear out of these in my day to day routine but they also look fabulous when paired with dressier pieces. My booties are old news, I still continue to love them and the futuristic go-go dancer vibe they bring to every outfit. I feel very comfortable but dressed up. Perfect for a holiday cocktail party. Are you dressing up, down, or somewhere in between for the holidays?